World War II Navy Muster Rolls are now being added to Fold3’s World War II Collection. 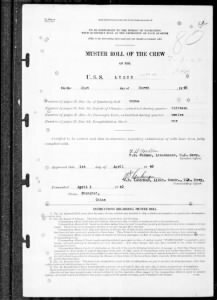 With a full title of “Muster Rolls of U.S. Navy Ships, Stations, and Other Naval Activities, compiled 01/01/1939 – 01/01/1949,” these are reports of enlisted personnel formally attached to ships, stations, or other commands (known as “activities”). They are assembled every quarter from reports of status changes, and may also include records of passengers aboard a vessel. A forwarding sheet accompanies each quarterly roll. It includes the name of the ship, number of pages in the report, the date, signatures of the executive and commanding officers, and from where the report was issued. Report of Changes forms, created monthly or whenever a major change in personnel took place, are an integral part of the muster roll. Men listed at the top of each form are referenced by the same number at the bottom where their circumstances are detailed and an explanation for the change is printed. In addition to duty transfer, a status could also include desertion, death, hospitalization, and change in rating. If passengers were aboard, they were identified in reports of Non-enlisted Passengers. 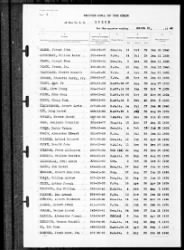 The Muster Roll of the Crew is a quarterly snapshot, identifying all personnel at a particular location, with full names listed alphabetically by surname. It provides service number, rating (rank), date of original enlistment, and when each person was received on board. You can create memorial pages from any name listed on the WWII Navy Muster Rolls and the Pearl Harbor Muster Rolls. Move your cursor to the appropriate line on the document image, click on the box that appears, and then on the sailor’s name. This will take you to a page where you can leave a tribute, upload photos, or add details about that person’s life. Explore the growing collection of WWII Navy Muster Rolls on Fold3.